Another year, another At A Glance. And it has been a year of momentous change in family law, as the preface to the latest edition of At A Glance recalls. Despite this, however, little appears to have changed within the covers of this indispensable publication. Yes, the tables have of course been updated, but otherwise... ? Well, a look at the index on the inner front cover actually suggests we are getting less for our £55 this time around, with two fewer tables than the last edition and no perpetual calendar. However, looks can be deceptive. The page number remains the same - what is now filling the space of the missing items? Well, one item is not actually missing. 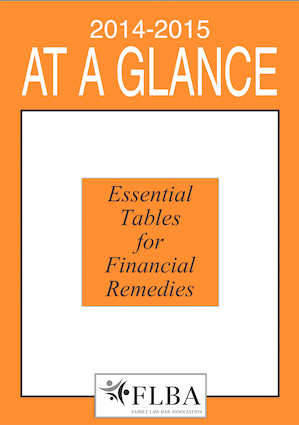 The list of useful websites is no longer a table but a page in the 'Other Financial Remedy Materials' appendix. The other missing table is the Office Salary Survey, which showed salaries paid and offered to office, secretarial and sales staff by private and public sector employers, and demonstrated the pay differentials across the country. I doubt that it will be missed by most users of At A Glance. The loss of the perpetual calendar is explained in the preface: space constraints mean that it no longer features. By its nature At A Glance is not the sort of publication that can be read from cover to cover (and nor, of course, is it intended to be), so it is difficult to say exactly how the four pages of the missing items have been filled. But that is not important. What is important is that you can continue to refer to At A Glance confident that the wealth of information it contains is up to date and reliable. And refer to it you will surely need to do. As the blurb on the back cover warns: Venture into client meeting or court without it at your peril!